Choosing the best time to visit Angkor Wat can be a little tricky. You almost have to choose between rain and muddy temple sites or good weather with hordes of people who always seem to be in the way of photographs. Following the typical weather patterns for much of Southeast Asia, the best time to visit Angkor Wat in Cambodia is during the dry season from late November to early April. Fortunately, with a little timing, you can take advantage of the best times to visit Angkor Wat. Even better, travelers who hire drivers to visit ruins farther afield get rewarded with those Tomb-Raider-Indiana-Jones photos with no other tourists in the backdrop. Cambodia’s crown jewel, the ruins of Angkor Wat and the surrounding Khmer temples, lure more than two million foreign visitors per year. Sometimes you'll feel as though at least a million chose the same day as you to visit! While rain can detract from the experience during the monsoon season, heavy crowds—also a nuisance—descend on the ruins during the peak of the dry season. Although Angkor Wat is open all year, getting good photos of the vine-strangled temples without scores of tourists clamoring around on them requires a bit of good timing. Even arriving very early in the morning is no guarantee you will enjoy tranquility at the primary temple sites. December and January are the best-weather months, but they are also the busiest as hordes of visitors and tour buses flock to see the monuments. Peak season runs roughly from December to the end of February. April and May are unbearably hot months in Cambodia. Avoid them unless you can handle heat and suffocating humidity as you explore the ancient temples. During these peak-heat months, you can enjoy more personal space at temples—assuming you don't mind a heat stroke or three. To really get the most out of your three-day-pass to Angkor Wat, consider timing your visit to coincide with one of the shoulder months between the monsoon season and dry season. November and March are often good compromise months for Angkor Wat. With a little luck, you'll still have sunny days that aren't scorching hot but fewer crowds with which to contend for photos. Monsoon rains move in around late May or June and persist until the end of October. September and October are typically the wettest months, with more than 15 inches of rainfall, while January receives the most sunshine. December through February are dry but are among the busiest months with tourists clamoring for photos. The Lunar New Year festival (which includes Chinese New Year and Tet in nearby Vietnam) causes nearly every popular place in Southeast Asia to become extremely busy for a couple of weeks as millions of people travel during days off. Accommodation prices go up, and negotiating a better deal at hotels becomes difficult. Dates change annually, but the Lunar New Year holiday hits in January or February. Angkor Wat is open 365 days a year, from 5 a.m. until 6 p.m. (closing time is only loosely enforced, so you can exit at your leisure until darkness falls). Although the Angkor complex is open 365 days a year, it may be busier than usual on Cambodian public holidays. Many holidays are based on the lunar-solar calendar; dates change from year to year. The Khmer New Year (coincides with Songkran in Thailand; always April 13-15 or so) may not be the best time to visit Angkor Wat. Instead, enjoy the unique festivities. More backpackers traveling along the Banana Pancake Trail in Southeast Asia tend to visit during the summer months while taking a break from school. You may not notice; Siem Reap is often in perpetual party mode. Visiting during Cambodia's monsoon season presents several new challenges. Aside from the distinct disadvantage of having to explore the many outdoor temples in the drenching rain, roads can become rutted, muddy, and impassable during heavy downpours. Remote temple sites may become difficult, if not impossible, to reach. Low areas turn into muddy pits, eliminating options such as biking leisurely around the area. Despite best efforts, getting photos of the memorable temples will be more difficult during torrential rains. On the plus side, visiting Angkor Wat during the monsoon season means less competition for stairs and photos. You can still luck out with spurts of sunshine, sometimes consecutive days at a time, even during the monsoon season. Intense showers may only pop up in the afternoons, leaving you with plenty of time to explore each morning. Additionally, mosquitoes are more of a problem during the wet season. Know how to avoid mosquito bites while traveling. Dengue fever is a problem in the area. The Khmer New Year, also called Chaul Chnam Thmey, spans three days in mid-April. This is the most popular and festive holiday across Cambodia; celebrations include parades, festivals, fireworks, and more. October 15 is a national holiday commemorating the memory of His Majesty Preah Bat Samdech Preah Norodom Sihanouk. He was the ruler of Cambodia immediately after the country gained its independence from France. The most popular time to visit Angkor Wat is during the dry season, which typically runs from November through March. These days are cool and dry, but this is also the most popular time to visit, which means crowds. Even though these months are technically "winter," temperatures are still quite warm. January, which is the coldest month in Cambodia, only sees lows of 70 F (21 C)! However, despite the more mild temperatures, weather during this season can still be somewhat unpredictable. You should be prepared for unexpected rain showers or the occasional heatwave to roll through. If you're planning a visit during the dry season, book your hotels and restaurants early. If you don't plan ahead, you might set yourself up for disappointment. Cambodia celebrates its Independence Day on November 9. This holiday was established to celebrate the country's independence from France in 1953. January 7 is another important day in Cambodian history. This day, Victory Day commemorates the end of the Khmer Rouge regime in 1979. To visit Angkor Wat, you’ll have to purchase either a one-day, three-day or week-long pass. 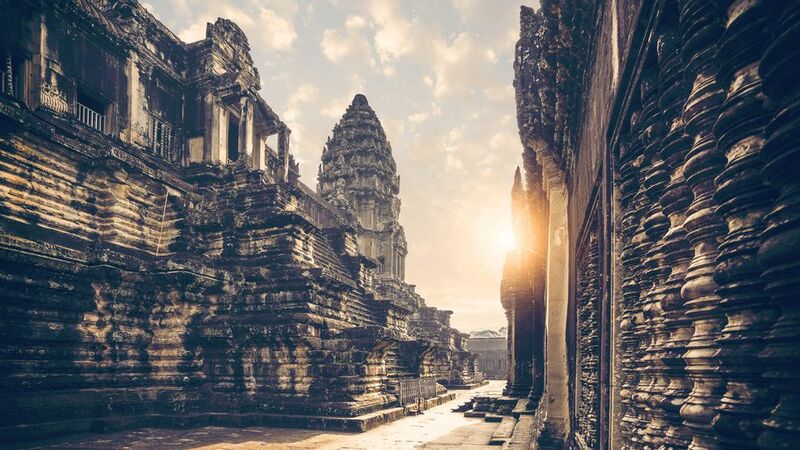 Although travelers with tight itineraries in Southeast Asia try to squeeze in as many sights as they can in a day, remember that the Angkor complex is actually the largest religious monument in the world! It's spread over 250 square miles of jungle. You’re going to need more time than you think to not end up rushing around. The temples are scattered all over Cambodia. If you're serious about exploring ancient Khmer ruins, plan on purchasing at least the three-day pass. Doing so is less expensive and troublesome than buying two one-day passes; you will end up wanting more than one day there.